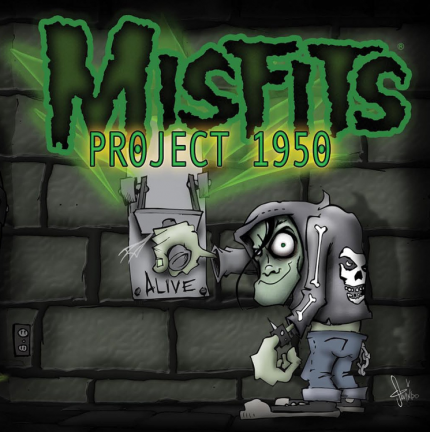 This MISFITS cover version of Monster Mash is featured on Project 1950; a studio album of early Rock ‘N Roll cover songs performed by MISFITS, released back in 2003, via Misfits Records. 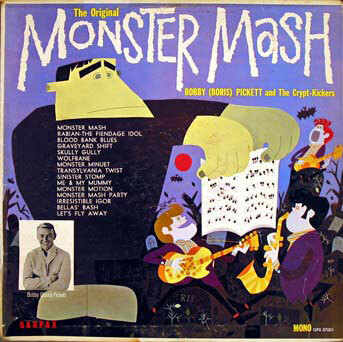 Monster Mash was originally recorded by Bobby “Boris” Pickett. The single was released back in 1962. Here I go again… pulling out another great and scary Rock song that is just eerily perfect for the Halloween season. In 1986, the ever legendary John Fogerty released his solo album – Eye of the Zombie, (on Warner Bros. Records). The cool release date of October 1st made this song all the more fitting for Halloween too. I was introduced to this song and album by my late sister, back in ’86, she knew this particular song was right up my Metal alley. With all of my time being occupied by Metal Music back in the ’80’s, I knew I could always count on my sister, to hook me up to some very cool mainstream Rock albums and songs from time to time. If my Metal memory serves me correct, the video for Eye of the Zombie, (which MTV played frequently then), was damn spooky and cool too. Just the way in which John Fogerty sings this song gets the creep out meter moving. Musically, this song Rocks in a very unique and spooky way. As for the entire album of Eye of the Zombie, I don’t find it difficult to recommend to any Classic Rock or Rock Music fan at all. This song and album may not have been the blockbuster of John Fogerty’s career, still, Eye of the Zombie is a song and album that I reflect upon for it’s originality and cool Rock vibe. Too many times, it is the Rock album and/or song that does not find chart success or critic praise that turns out to be the true Rock and Roll wild card of a musicians career. Change in the Weather was the song talked about most from this album, with it’s Creedence Clearwater Revival roots, yet it is the allure of the song Eye of the Zombie that had me listening to the entire album itself. The front cover album artwork for this album is a visual nightmare image of a horrible looking creature… a zombie perhaps, only to me it appears to be more of a half man, half lion monstrosity. Very cool image nonetheless, something you would expect on a Metal Band’s album cover. In the end, if it has always been construed that John Fogerty took a Rock Music risk with this album, then I will be Metal bound to say it was a fabulous risk to take. The song Eye of the Zombie is one not to miss listening to this Halloween season… nor is it not a risky bet to get into the rest of this album any time of the year. ‘Fore the darkness takes us all. The evil waits with zombie eyes. 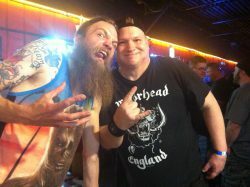 Eye-eye-eye eye of the Zombie! To join the dance on the zombie. And there’s nothin’ you can do. Oh! Hoo! Aaa-aah! Hoo! Aaa-aaa-aaaah! We’re brought to our knees. Halloween is coming and there are scary songs aplenty out there, to get me in the spooky spirit. I came up with a list of my favorites, each song a true Classic in it’s own frightful right. Heavy Metal, Hard Rock and Punk Rock are all represented here well with cool and frightening songs… go ahead… peruse and enjoy this list – if you dare! Monster Mash – Misfits – I really get a kick out of the Misfits cover version of this 1962 Bobby “Boris” Pickett original. The Misfits cover version can be found on their albums Project 1950 and Cut’s From The Crypt. The Bobby “Boris” Pickett original version of Monster Mash reached #1 on the Billboard Hot 100 Chart on October 20, 1962. I covet the original version just as much as the Misfits cover. Werewolves of London – Warren Zevon – this song is originally found on Warren Zevon’s 1978 album Excitable Boy. I just bought the live version of Warren Zevon’s Werewolves of London on itunes a week ago… the live version is unreal good. Since I first heard this song in 1978, it never ceases to put me in the Halloween mood, no matter what time of year I listen to this great song. Godzilla – Blue Oyster Cult – this song is found on the Blue Oyster Cult album Spectres, released in 1977. The live version of Godzilla is found on their 1978 album Some Enchanted Evening… I lean towards liking the live version more, always have. The live version just seems to have more total heaviness – a Classic Rock gem. Halloween – Helloween – alright, now we are talking about some serious Metal here. The 1987 album Keeper Of The Seven Keys Part 1 is where you can find this song, truly an amazing Power Metal epic… at 13 minutes & 18 seconds long, yet every second is Metal brilliance. This song exploits the vocal excellence of Michael Kiske, he was an incredible singer for Helloween, period. Boris The Spider – The Who – Released in 1966 (the year that I was, gulp, born) – A Quick One is The Who album where this legendary song is found. A short song, at 2 minutes & 29 seconds, the late John Entwistle gives this creepy little song it’s Rock character through his bass and vocals too. The Number of the Beast – Iron Maiden – Whoa, this song gets better each time I hear it… I am sure I am not alone in stating that. Released on the Number of the Beast album from 1982, it seems like yesterday to me. Old Carver’s Bones – CKY – From the 2009 CKY album Carver City, this song is scary with multiple exclamation points. The music and lyrics of this song makes the creep out meter catch on fire. Dead Skin Mask – Slayer – In 1990, Slayer released Seasons in the Abyss – just the title of this song says enough… F’n Slayer rules. This Is Halloween – Marilyn Manson – I practically inhale this song every late September up until Halloween night. This Is Halloween sung by the legendary Marilyn Manson, can be heard on the re-release of The Nightmare Before Christmas Soundtrack, (re-released in 2006). Metal truth be told, this is probably my most favorite Marilyn Manson song ever… and I like a ton of Marilyn Manson songs a great deal. Marilyn Manson sounds so damn mean, nasty and scary on this song that it creates a thunderstorm in the sky above, wherever it is played. Frankenstein – Over Kill – this Thrash Metal cover of the Edgar Winter original is frighteningly unreal good. An instrumental, there is no need for lyrics… the music is alarmingly spooky to the maximum. I embrace the Edgar Winter original as much as the Over Kill cover version… bear in mind the Over Kill cover version is damn heavier!! The Over Kill cover version is found on their 1991 album Horrorscope. The Edgar Winter Group original version of Frankenstein is on their 1972 album They Only Come Out at Night. Black Sabbath – Black Sabbath – from the debut self titled album Black Sabbath, (released in 1970), the song Black Sabbath carries me through a nightmare that I never mind revisiting. Everything about this song spells chillingly scary… from Ozzy Osbourne’s vocals to Tony Iommi’s doom laden riffs, the godfather of creepy Metal songs without a doubt in my Metal mind. I could go on until Doomsday with a master list of scary and horror laden songs that get me pumped for Halloween. These songs are the ones that I seem to listen to the most, (or so it seems). Maybe you agree with this list of shock and scream songs, maybe you have a song to add to this list too… don’t hesitate to give your suggestion or two for songs that are just as frightening or more so. Happy Halloween.